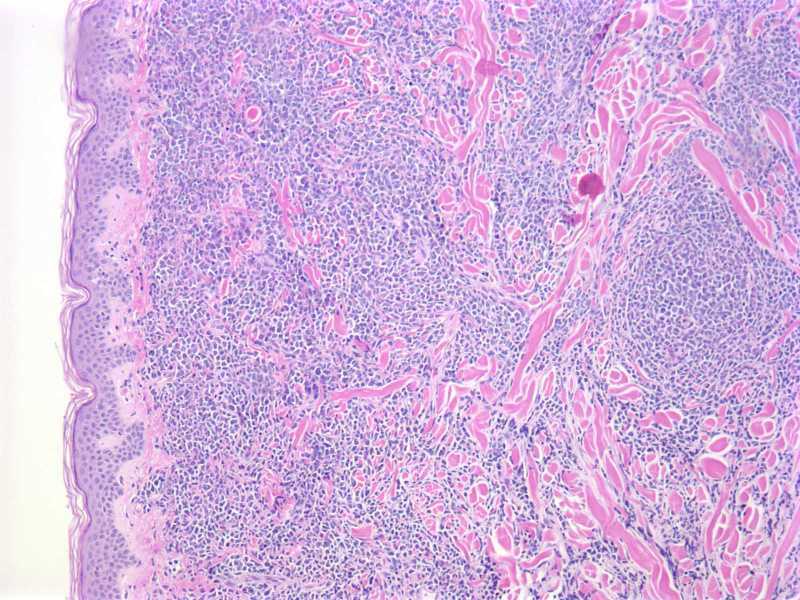 This email is only sent to subscribers.� To subscribe or unsubscribe, email NatPernick@Hotmail.com, indicating subscribe or unsubscribe to Pathology Case of the Week.� There is no charge.� We do not sell, share or use your email address for any other purpose.� We also have free email subscriptions for Pathologist/PhD jobs (biweekly), Other laboratory jobs (biweekly), Pathology fellowships (biweekly), Pathology fellowships (biweekly), Pathology website news (monthly), Pathology new books (monthly) and The Detroit College Promise-the charity which we sponsor (monthly).� Email us to subscribe. 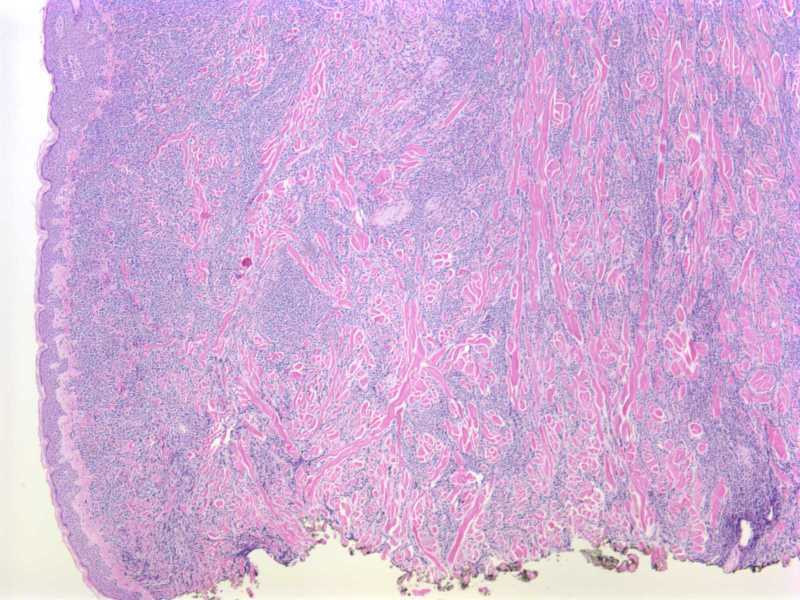 A 68 year old woman with a history of AML presented with a five month history of progressive eruption of violaceous firm nodules in the umbilicus, groin, trunk and scalp. A left breast punch biopsy was performed. 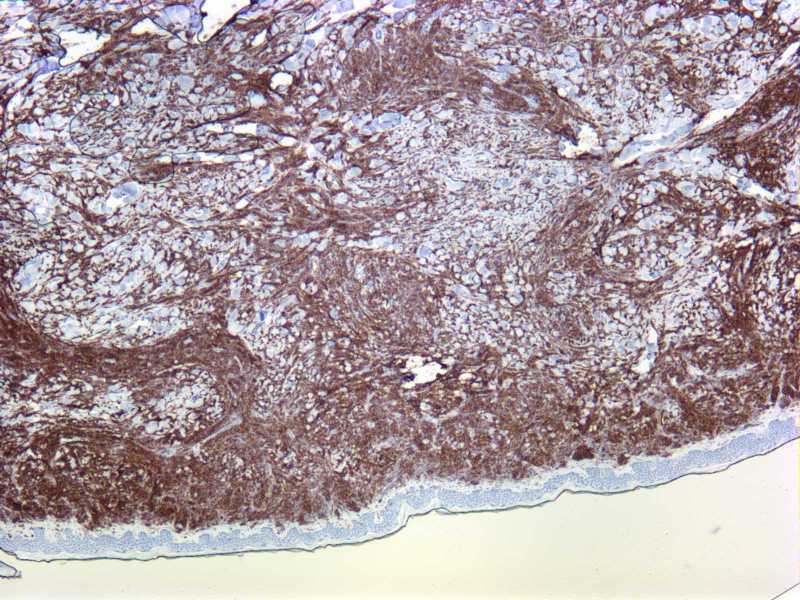 The dermis and superficial subcutaneous fat are diffusely infiltrated by a monotonous population of large cells with a high nuclear to cytoplasmic ratio, round to slightly irregular nuclear contours, finely dispersed chromatin and prominent nucleoli.� The tumor cells are diffusely immunoreactive for CD45, CD117 and CD43, with focal expression of CD68. 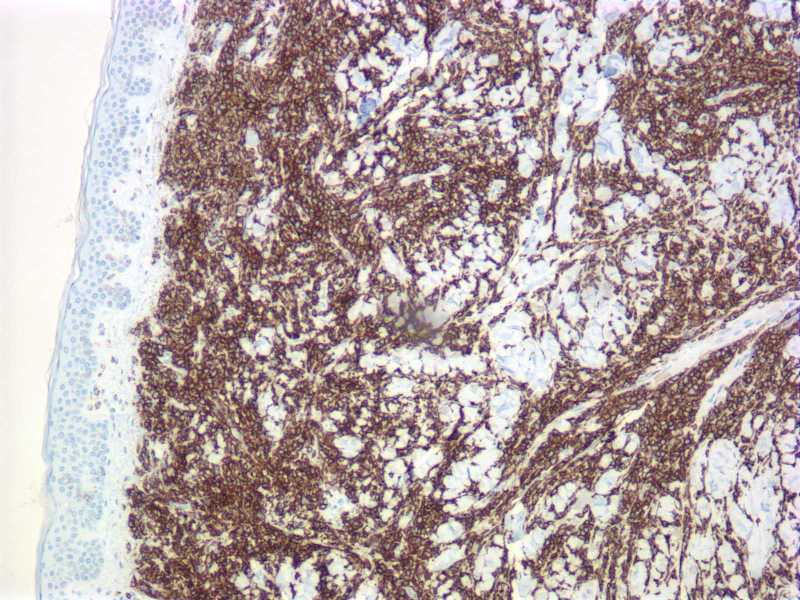 Myeloperoxidase (not shown) highlights a small subset of tumor cells. 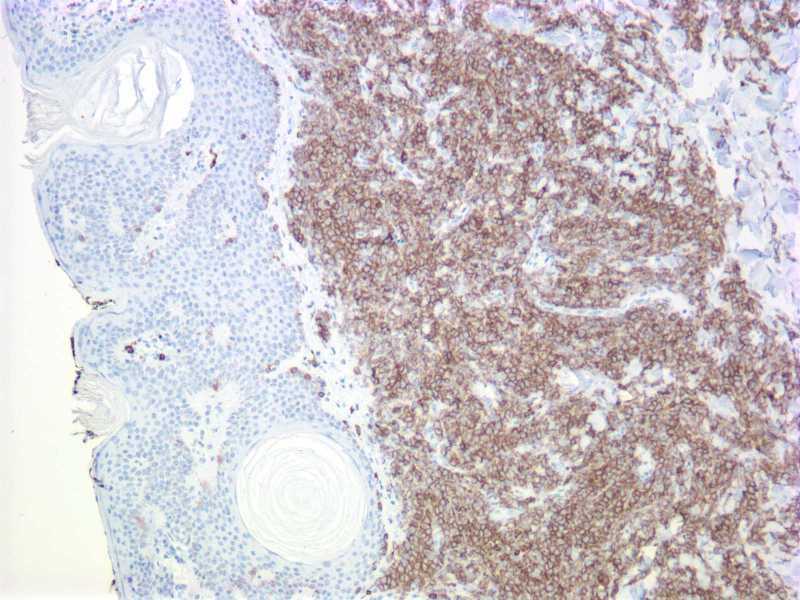 The cells are negative for CD34, TdT, CD20, bcl-1, and CD56. 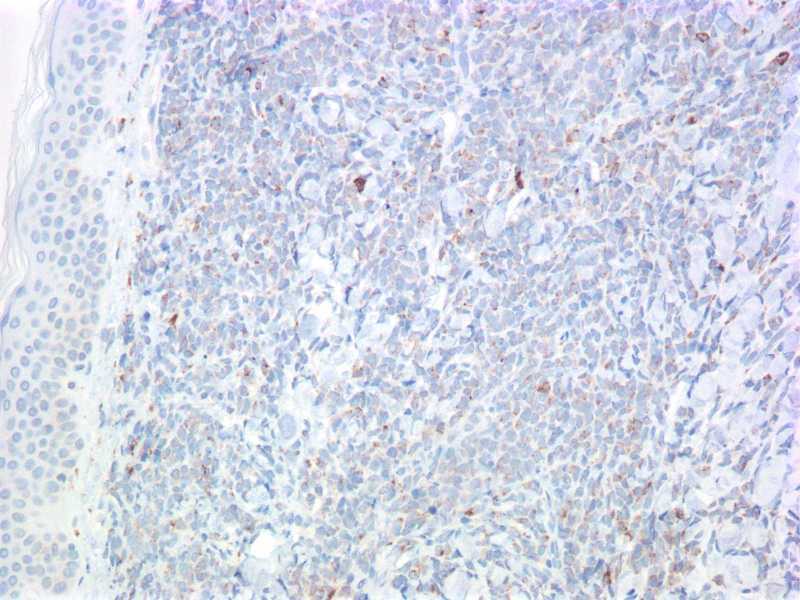 CD3 and CD4 (not shown) highlight scant, admixed T-lymphocytes. 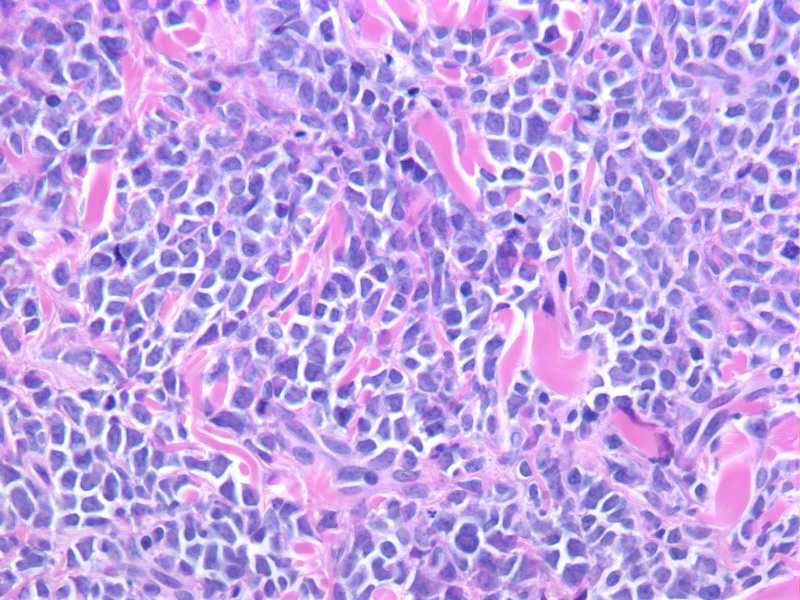 Overall, the morphologic and immunophenotypic findings are consistent with tissue infiltration by acute myelogenous leukemia.� The prior AML subtype is unknown. 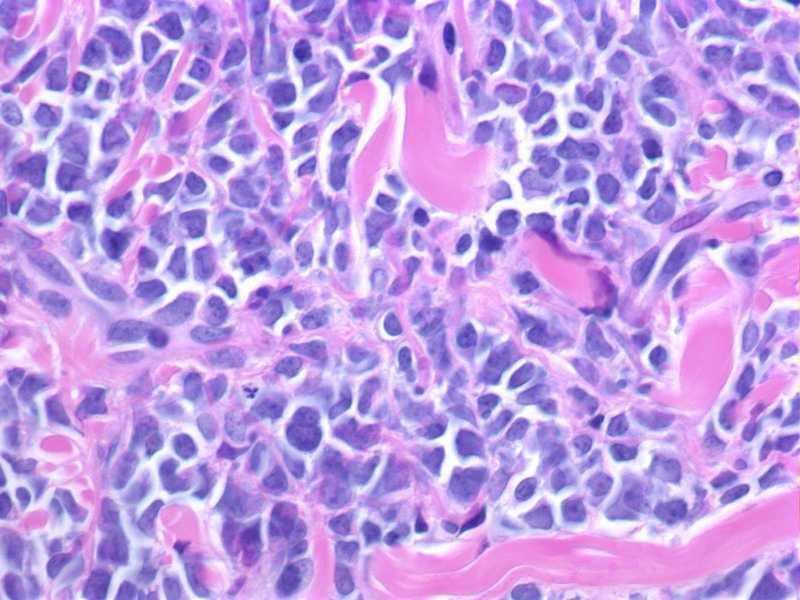 Leukemia cutis is associated with aggressive behavior and short survival (J Am Acad Dermatol 1999;40:966).� Treatment is systemic chemotherapy directed at eradicating the leukemic clone.